We now have December data for global liquid fuel production, which allows us to see the whole year. 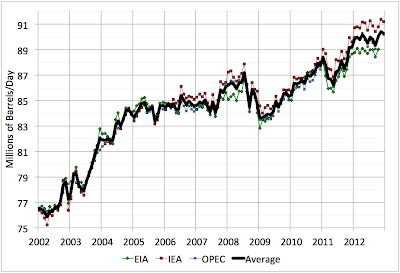 What has been striking about 2012 is that oil production has been remarkably flat, with no significant rise across the year (there was a small 0.25mbd/yr trend overall, but that was not statistically significant). This is in contrast to 2009-2012 when production has generally increased, except for the interruption of the Arab Spring, particularly the loss of Libyan production in early 2011. 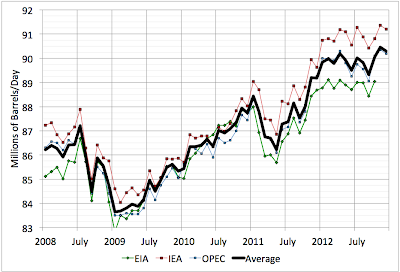 Instead, 2012 looks more like 2005-2007 when production was pretty much flat, occasioning a huge spike in global oil prices. You have had several posts about production of tight oil at Bakken but I have not seen that you have “high lighted” the flaring of gas connected to the production. What a waste! not sure about the prices rises. ok the top barrel is at USD 90+ with tar sands but there is a long way for other types of oil to get there, plus it's mostly Saudi needs for higher budgets (100+) that's driving the price those days through production cuts. 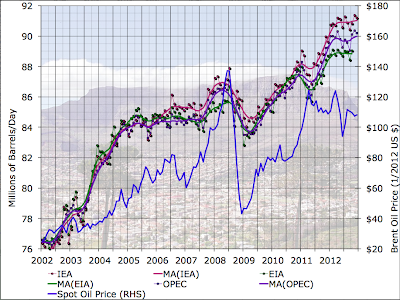 mid-term wise I say that in next 2 years output will continue to rise at snail's pace, perhaps a good year in 2013. after Manifa in 2014, due to lack of mega projects to compensate for base declines, everything really rests on the underlying capacity to maintain plateau and how shale oil will deliver. ok the volumes are material but can it last? as for predicting accurately peak oil, the debate is irrelevant. since field engineers operational reserves computations are within 20% accuracy on average. this means that even if all the countries in the world gathered together to exchange notes and compile a field by field tally based on actual detailed geological modelling the range of uncertainty would still be about 10-20 years. this is no argument for the sceptics btw, even assuming the famous "2030" deadline, that's a mere 17 years away. mega projects do take 10 years to be engineering and executed. so we're pretty much talking about taking right now dramatic changes to our energy system, when growth from China and India will outstrecth any solution we have and under constraint of global warming. that's one huge order I say. We still appear to have conflicting studies over whether shale gas can act as a bridge fuel to a low carbon economy (I have strong doubts), but this will add fuel to the fire if you forgive the pun. "Moore's Law for transistor count is ending, but now there's Moors' Law for oil and it says gasoline -- US national average -- will be $7 in 2017 as oil reaches $120 a barrel. The law is named for Kent Moors, a professor Duquense U. 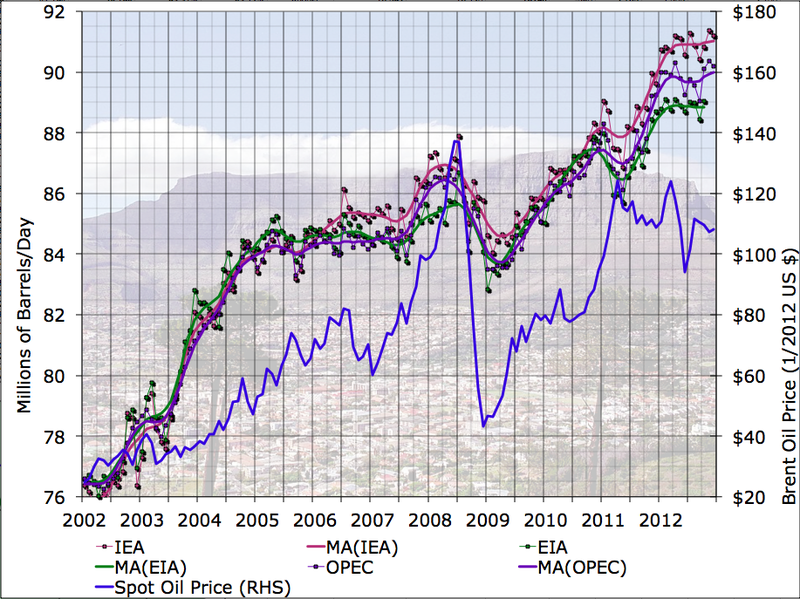 Specifically, the price of oil and the number of cars in China, which drives it, double every 5 years. These prices change everything in society."